For those who don’t know, Babayaga is a witch in Russian fokelore. She’s typically presented as your Hansel and Gretel like witch, punishing bad little children and eating them up. Babayaga also is known for being a fairly vengeful witch, destroying men who’ve scorned women. Think the Greek fates meet witch meets boogeyman. 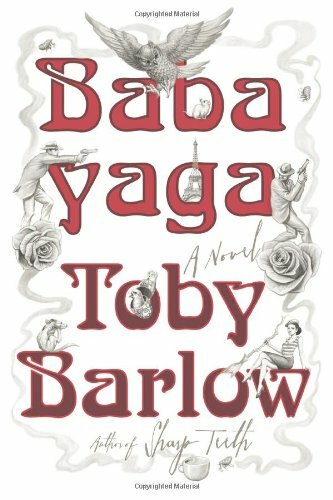 Barlow’s Babayaga follows a young man Will who is living in Paris during the end of the Cold War. He’s been working as a lower level intelligence gatherer and an advertising specialist. He gets caught up in an agency misadventure where he meets Zoya, a beautiful Russian woman who, unbeknownst to Will, is a serial murderer. For hundreds of years Zoya has been travelling Europe with her sister witch Elga killing men and conning their way in and out of riches. Zoya has most recently impaled a French man who had been sleeping with her on a barbed fence. Unfortunately for Zoya, the police are hot on her trail. She goes to Elga’s apartment, but leaves quickly after they have a fight. The police track Zoya to Elga’s home. Elga curses the two policemen, turning them into fleas, and must again pack up and leave. Elga, furious, decides that it’s time for Zoya to go. But first she must get help. No witch can be killed single-handedly. Meanwhile, Zoya is attempting to help Will to survive his encounters with the Agency. This book was an okay read. I wouldn’t say it’s great, but it isn’t bad either. I did enjoy the extensive backstory that both Zoya and Elga get. Though we could consider them anti-heroes at best, they’re at least anti-heroes with a history. It’s unfortunate that Barlow doesn’t explain why they seem bent on killing men without cause. Zoya throughout her history has picked men to seduce and swindle, then the two will invariably kill them. It’s made clear that Zoya hasn’t always wanted this, but that Elga has insisted and claimed it vital to their survival in a deeper way than someone simply finding out that they’re witches. What makes it so vital is never discussed. I thought Will was a fairly mediocre character. Though he is introspective, he’s ridiculously naive and doesn’t really gain in world experience throughout the story. This is a surprising feat for a man about to encounter conspiracy, the CIA, and witches. The inspector who follows the story throughout could have been cut entirely and the story would have been no worse off. What I didn’t like was how heavy handed that Barlow was with Elga’s man hating. It’s one thing to have her say and think that men are easily manipulated or that men seek power. Elga’s history has a great deal of precedence for this. But he lays it on pretty thick. He even goes so far as to have her rant about penises and power. I would suspect that a centuries old witch wouldn’t take too much stock in anyone who thinks they make the rules. Mostly, though, it was so frequently brought up without any real action on Elga’s part as to make the book drag and its pacing slow to a grind. This entry was posted in Reviews and tagged Babayaga, book reviews, Books, Elga, Fairytale Retellings, Toby Barlow, Zoya.